OK, so it doesn’t actually see in Infra Red, but it looks the part (perhaps one day?) 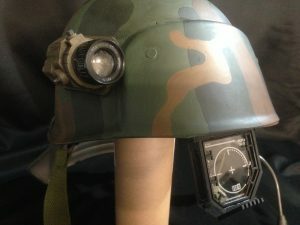 Each Marine helmet had an inbuilt drop-down IR sight. The real finishing touch to your grunt lid. These are available as a 3D Printed Kit with laser-etched reticles, then they are spring loaded and illuminated with 2 white LEDs (Batteries not included! ), or we can pre-build it for you. These are special items and as such are made to order. Email for availability, due to limited stock. Build tutorial is available in the tutorials section.